Keith: Gary, you and Chris Roberson worked on the tunnel office. Could you describe what you did on this part of the layout? 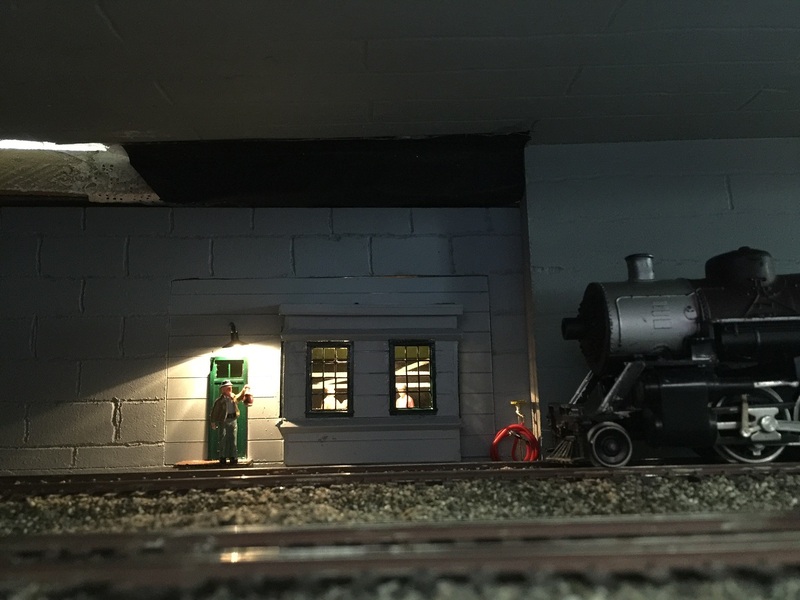 Gary Soler: Chris had a problem when the switchers were located inside the tunnel ( Ed: the tunnel by the roundhouse is very close to the switching yard, so when switching locos were in use they would sometimes need to enter the tunnel as part of their switching operation) so he had to make a lift out. While he was making the lift out he decided to put these portals in. (Ed: there are three windows that allow viewing into the tunnel – see photos). Keith: These are the gaps at the front? Gary: Yes, the three openings. So Dave brought in a picture of an office that used to exist in the snow sheds up on Donner, and Chris wanted to duplicate that office, but didn’t know how. So I built it for him. Keith: OK. So you scratch built this? Gary: Scratch built it, to fit the opening he gave me. Keith: So what were you using, basswood? Gary: This is all styrene. The outside wall was made of, they call it, metal roofing, because it has all the lines and scribes in it. I used that as the outside wall, a positive/negative thing. So I just cut it, put a bay window in it, from Grandt Line Products, put them in, painted them green. Painted the whole thing with grey primer, just came in with a little brush and painted the windows green. So in the picture there was a hose against the wall and the light, I couldn’t duplicate the light, but I did put the hose by it, so it kinda adds that little ambience to it. I did put people inside and the original idea was to light up the whole tunnel, but I didn’t like that. So, my idea was to backlight the office so that when you looked in, the light was coming from behind the little figurines in there. 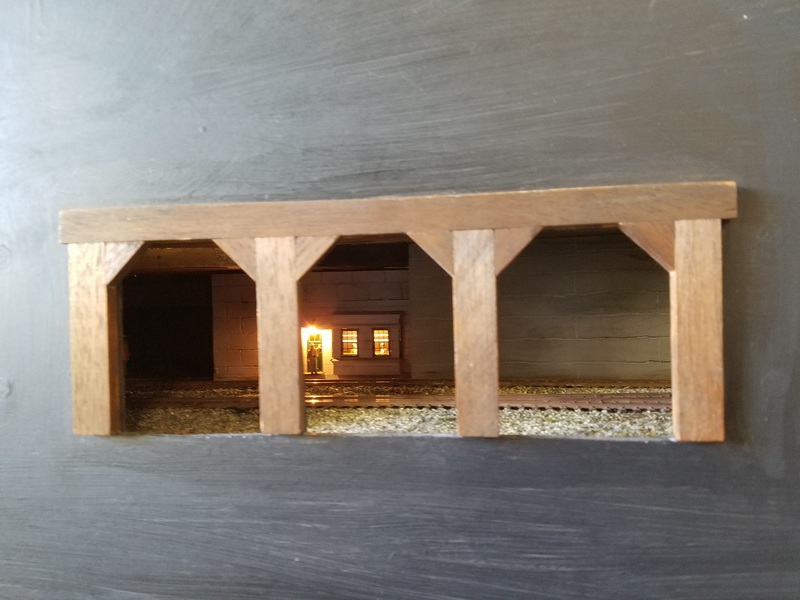 Well, I put another light in there to light them so that you can actually see the detail in the little people, plus you get the backlighting shining out into the tunnel. Gary: And the club seems to like it!